(MENAFN - The Conversation) This piece is part of a series on race and racism in Australia. The series examines this complex and incendiary topic, and the role it plays in contemporary Australia. In October, the ABC's Background Briefing outlined how the NSW Young Nationals Party had been the target of an organised infiltration attempt by members with neo-Nazi or 'alt-right' views. Once this infiltration was exposed, 22 members were banned for life and individuals in other extremist groups were barred from becoming future members. The group's aim was to influence party policy in the area of immigration, as shown in motions they proposed at the Young Nationals' annual conference. Controversially, they wanted immigration to be curtailed to only ' culturally compatible peoples ' and for white South African farmers to be granted refugee status on the basis of racial oppression. These views have been gaining support in Australia. Senator Fraser Anning and MP Andrew Laming have both spoken publicly about the plight of white South Africans , and Home Affairs Minister Peter Dutton floated (then discounted) the idea of special visa attention for the farmers . Senator Pauline Hanson's most recent maiden speech in 2016 also called for an end to multiculturalism and the granting of visas for 'incompatible' people, specifically Muslims. These views are based – perhaps unknowingly - on a core belief of neo-Nazis: so-called 'white genocide'. The defence of Western civilisation and pride in 'white' achievements – on the rise both here and abroad – have become racist dog whistles for this call for action to prevent the 'disappearance' of the white race. This fear of white genocide is also leading to violence. The shooter who killed 11 people in the recent Pittsburgh synagogue attack justified his actions by claiming that Jews were committing 'genocide' against his people. So, what is 'white genocide'? White genocide adherents want a return to a so-called traditional way of life defined by the nuclear family and prescribed gender roles . They divide humans into separate races and see multiculturalism and migration as a threat because each race should be contained to their perceived homeland. The idea of a homeland is important. Following the second world war, American neo-Nazis drew on notions of place and race that took root in Germany in the 19th century and were later adopted under Adolf Hitler as the slogan ' blood and soil '. 'Blood and soil' is the cry of the nativist, asserting the belonging of a people to a place to the exclusion of outsiders. The slogan reappeared as one of the chants at the Unite the Right rally in Charlottesville, Virginia, in 2017. 'Blood and soil' was among the many racist chants of protesters in Charlottesville. For white nationalists, this idea forms the 'solution' to the threat of white genocide. Neo-Nazi groups like Identity Evropa advocate for ceasing immigration from 'non-compatible' nations and encouraging population growth amongst whites. The most important goal of white nationalists, however, is the creation of a white ' ethno-state '. This is a state that is presumed to have strong bonds and social cohesion due to shared ethnicity or race, as argued by the evolutionary psychologist Kevin MacDonald . Some adherents go so far as to call for the removal of non-whites from multicultural societies, such as the US and Australia, to so-called ethnic homelands in other parts of the world. After the US, Australia has the most active white nationalist presence on social media, according to J.M. Berger , a leading researcher on extremism. 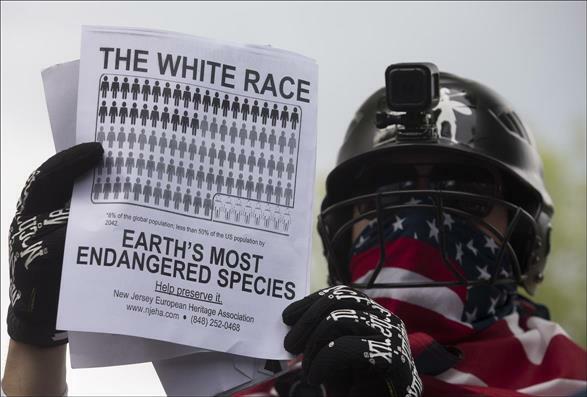 Over the past 10 years, various white supremacist groups have formed online, such as the self-described neo-Nazi group Antipodean Resistance . As documented by the ABC , the ideas of neo-Nazis like Pierce and Lane are also actively being explored in secret online groups in Australia. An influential collection of writings called Siege by the neo-Nazi James Mason was cited as an inspiration for some of those expelled from the NSW Young Nationals, along with the aim of creating an ethno-state . Another recent manifestation of this white supremacist ideology is the meme 'It's OK to be white.' Worn on a T-shirt by Canadian racist provocateur Lauren Southern during her recent visit to Australia, then raised as a motion in the Senate by Hanson, the slogan aims to portray whites as victims who are not protected by anti-racism legislation or social practices. It is this belief that whites are being targeted that underpins the resignation letter of the leader of the NSW Young Nationals infiltration attempt. Clifford Jennings claimed that young white Australians face a grim future in which they are at risk of becoming a 'harried, persecuted minority' due to an 'oppressive multicultural regime' supported by the 'treasonous' leaders of the major parties. Jennings is harking back to the long-abandoned Immigration Restriction Act (1901) and other racially targeted pieces of legislation known colloquially as the White Australia Policy . These privileged certain Europeans in migration programs with the aim of ' keeping Australia white '. But how do Australia's white supremacists side-step Australia's 60,000 years of Indigenous history? For the believers in white genocide, the term 'genocide' does not refer to the impact of European colonisation on Indigenous peoples because they claim Australia only came into being as a nation with the arrival of white Europeans. Of course, the idea of whiteness itself in Australia has changed dramatically over time. And despite the claims of DNA testing companies, there is no scientific basis for 'race' itself and, therefore, for racial superiority claims. Regardless, the white genocide theory is based on a flawed premise – that only white people can be authentic Australians (or residents of other perceived 'ethno-states'). And in multicultural Australia, the facts tell a different story.